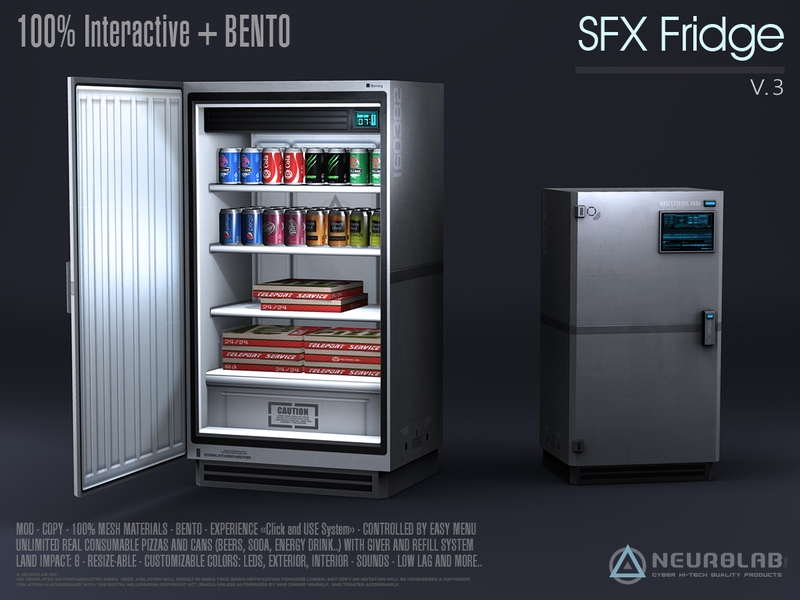 THE MOST REAL AND FUNCTIONAL REFRIGERATOR, AT ONLY 6 PRIMS ! Beers, Sodas, Juices and Energy Cans in UNLIMITED ! • ONLY 6 prims PE !!! – you can refill each things or all. If ON all dropped items (beer, pizza, pizza part) will disappear in 10 minutes. You can decide who can use the fridge and its content. By default the temporary feature is ON and the permission is set to « Owner » for security reason. That’s why we have added the temporary feature, turn it OFF at your own risk. Touch” anywhere inside of the refrigerator the Food/Drink to take up. When you have pizza or Cans in hand. you have choice: Drop or Trash. when you have eat 8 parts, the box remain empty !!! • 100% MESH+ MATERIALS ! • ONLY 2 PRIMS PE !!! – Wear pizza box (Right click and use ADD) or drop to ground. 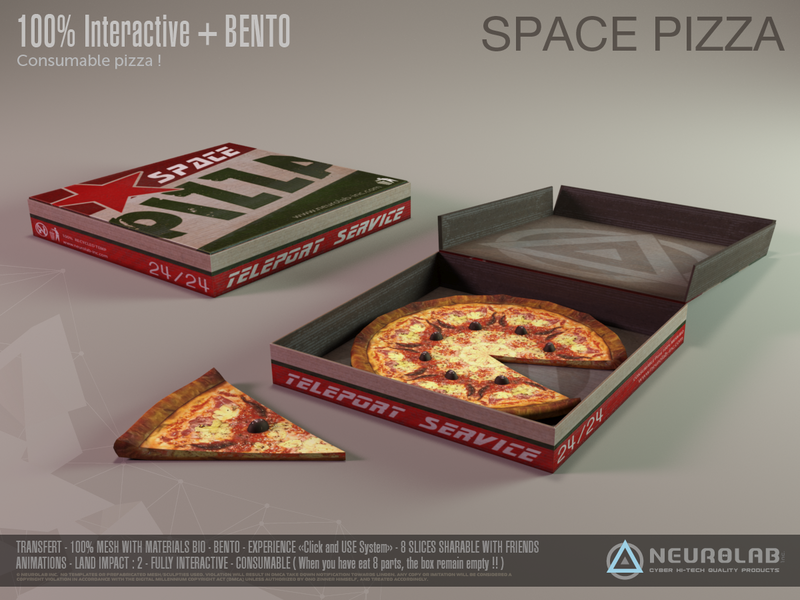 – Unwear: touch pizza box and use “Drop” or “trash” to menu. Now the soda vending machine will ask a permission the first time you use it, but will never ask again (until you leave the Neurolab experience or remove the experience from your land) If you are estate owner or manager, you can add the experience to the region if you prefer. 1.5 – Change Control Default MODE for OWNER without GROUP required.